The photographs in this book were made by Jungjin Lee in the Everglades for the Norton Museum of Art’s exhibition “Imaging Eden”. Bringing her unique meditative approach to this subject, Lee captured a sense of stillness in the constantly moving landscape – one inhabited by endangered species like the manatee, the American crocodile, and the elusive Florida panther. Her photography is imbued with elemental vastness and wonder. Using a multilayered process that integrates elements of painting, Lee’s photographs exude a materiality not often found in photography. The Florida Everglades is one of the most extensive and complex wetlands on our planet. It has been declared an International Biosphere Reserve, a World Heritage Site, and a Wetland of International Importance. It is the third-largest national park in the lower 48 states. 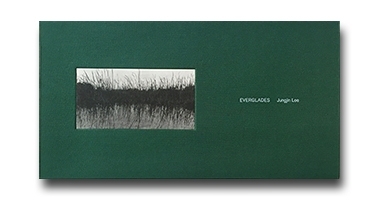 Beautifully printed on lush uncoated Japanese paper, Everglades is limited to 2,000 copies presented in a green cloth slipcase; both book and slipcase were designed by the artist herself. Jungjin Lee’s photography is imbued with elemental vastness and wonder. A former assistant of Robert Frank, she creates large scale landscapes employing a unique interplay between image and material. Jungjin Lee was born in South Korea in 1961. Her photographs have been widely published and exhibited internationally, and are housed in many important collections, including those of the Metropolitan Museum of Art; Whitney Museum of American Art; FNAC, Paris; the LA Museum of Art; and Houston Museum of Fine Art. Signed special edition w/ print also available. Please contact the gallery for pricing information.